Minot Air Force Base 5th Bomb Wing Commander Col. Matthew Brooks and Command Chief Master Sergeant Paul Elliott visited Minot State University Jan. 9 to learn more about the Veterans Center and services available to current and past service members, their spouses and dependents. They witnessed the various opportunities that exist for students as well as Minot Air Force Base personal. Pictured, left to right, are Veterans Center Director Andy Heitkamp, Command Chief Master Sergeant Paul Elliott, MSU President Steven Shirley and Minot Air Force Base 5th Bomb Wing Commander Col. Matthew Brooks. To celebrate the birthday of Martin Luther King Jr., a man with a dream, the MSU Diversity Council invites Minot State University and Dakota College students to communicate their dreams, in a written form that showcases their talents (essay, poetry, etc.). Entries must be submitted by Jan. 31 to Annette Mennem or Evelyn Klimpel, MSU Diversity Council co-chairs, in the Native American Center (Student Center 305). Prizes are credit at the MSU Bookstore: $100, first place; $75, second place; and $50, third place. For questions, contact Mennem at 858-3112. The 2017 Spring Club Fair will be Jan. 18 from 11 a.m. to 1 p.m. (with free food for current students beginning at noon) on second floor of the Student Center. Tables are limited. Club advisors are encouraged to contact their respective organizations to confirm, and RSVP to Aaron Hughes, student activities coordinator, at aaron.hughes@minotstateu.edu as soon as possible. Diane Sjol, nursing associate professor, Renee Duncan, nursing instructor, Melissa Fettig, student health director and Omicron Tau president, and Jamie Hammer, MSU alumna and Trinity Health nurse, are leaving on a mission trip to Haiti Feb. 15-24. Representing Omicron Tau, Sigma Theta Tau International, a nursing honor society, and teaming up with Third World Missions, they are collecting donations, which can be dropped off in the nursing department. They are taking medical supplies and providing nursing care to more than 80 children at an orphanage. The nurses will also help out at the clinic Third World Missions built across the street from the orphanage. Along with these 80 children Third World Mission cares for, more than 500 children attend school there. To learn more, visit Third World Missions. For questions, contact Sjol at 858-3699 or Diane.Sjol@minotstateu.edu. 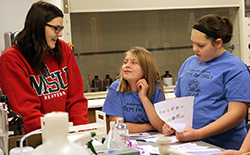 The Minot State Science Club, under the supervision of Naomi Winburn, chemistry instructor, hosted an event Jan. 5 for female elementary students. The event’s theme was forensic science. The students went from station to station analyzing evidence in order to figure who committed a crime. About 45 elementary students attended. For questions, contact Winburn at naomi.winburn@minotstateu.edu. The Staff Senate Holiday Decorating Contest judges named the Office of Facilities Management as the competition’s grand champion Dec. 9. The other top four entries overall were Gordon B. Olson Library, second; College of Business, third; the North Dakota Center for Persons with Disabilities, fourth; and Veterans Center, fifth. Recognition was given for appearance and display impact to facilities management, library, CoB, NDCPD and enrollment services. Creativity was acknowledged for facilities management, NDCPD, library, CoB, Veterans Center and Chemistry Club. The theme (favorite holiday song) was best portrayed by the library, first; CoB, second; facilities management, third; NDCPD, fourth; advancement, fifth; and the Communications Disorder Clinic, sixth. Originality was showcased the best by facilities management, first; Veterans Center, second; library, third; CoB, fourth; advancement, fifth; and Chemistry Club, sixth. The POWER Center also competed. 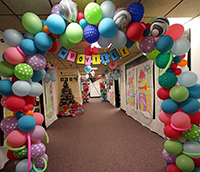 The Office of Advancement’s Whoville is pictured. The Minot Area Chamber of Commerce Governmental Affairs Committee hosts Saturday legislative forums at the North Dakota State Fair Center, with the first forum Saturday (Jan. 14) at 9 a.m. The forums give attendees a chance to meet with Minot area legislators and ask questions. The format includes a moderator who asks questions submitted in writing by the audience. Each session runs from 9 to 11 a.m. at the NDSF Center. Other dates are Jan. 28, Feb. 4 and 18, March 4 and 18 and April 1. Minot State University welcomes new employee, Kyle Patterson, as an admission counselor in the Office of Enrollment Services. He earned a bachelor’s degree in broadcasting at MSU. As a student, he won multiple Eric Sevareid Awards, and he was named the 2013 Broadcast Senior of the Year. He previously worked for KSJB Radio in Jamestown. He and his wife, Kelsey, an alumna, have a son, Landon. For hobbies, Patterson enjoys camping, playing video games and watching movies. Jan. 11-Feb. 15 — “Sea Change” by Fawn Atencio, a Denver artist and Best-of-Show winner in MSU's Americas 2016 Paperworks competition, Library Gallery. Jan. 11-Feb. 23 — “Americas 2017: Paperworks," a national juried exhibition with guest juror Michael Strand, Hartnett Gallery. Maria Buchholz, assistant professor of criminal justice, completed her doctorate in criminal justice at North Dakota State University in December. Wojciech Cebulak, professor of criminal justice, represented Minot State University in presenting a paper titled “Ethics and Law in Criminal Justice: A Fresh Look at an Old Issue” at the American Society of Criminology annual meeting Nov. 16-19 in New Orleans. ASC is an international organization whose members pursue scholarly, scientific, and professional knowledge concerning the measurement, etiology, consequences, prevention, control, and treatment of crime and delinquency. This year’s meeting had more than 1,200 sessions and more than 4,000 attendees. Miriam Dumes and Erin Kampen, College of Business students, competed Nov. 10-13 on two separate teams with University of Regina students at the school’s Hill Case Competition. Twenty-eight teams competed. Kampen was on the team that got second place overall, and Miriam Dumas was on the team that received the Most Professional Presentation Award. They were the only delegates from the United States. The case all teams worked on regarded motivating millennials for volunteerism for the United Way. Guy Hanley, assistant professor of science, successfully repaired a $7,000 large-format printer/plotter destined for disposal. Careful disassembly, cleaning, a system upgrade and the purchase of a $30 part brought the machine back to like-new operation. The Division of Science has relied on a plotter printer purchased nearly two decades ago and has undergone two mechanical rebuilds by Hanley. The newer plotter is vastly superior in image resolution and printing versatility. The science division prints many research posters throughout the year, and having the ability to print in house results in large cost savings and rapid turn-around times from layout to final product. Hilory Liccini, NDCPD research associate, and Melissa Naslund, school psychology instructor, presented at the 2016 Association of University Centers on Disabilities conference Dec. 5 in Washington, D.C. Their poster presentation, “Success Story in Engagement: Moving from Presentation to Activity and Discussion,” highlighted ways to actively engage youth with disabilities in trainings directed at the 13 components of self-determination. Paul Markel, psychology professor, and Brianna Martin, a senior psychology major, presented a poster, "Acquisition of an alternative communication system in the haptic spatial modality," at the University of North Dakota's Northern Lights Psychology Conference Oct. 22 in Grand Forks. This is the first time a student of Minot State University's psychology and addiction studies programs on Bismarck State College’s campus and mentored at the Bismarck site has presented research.